The Quad will be changing names again. The hotel formerly known as Imperial Palace was re-named The Quad in December of 2012. Starting in fall 2014 it will be known as The Linq Hotel and Casino. The question I have: Was this planned all along? Since the early days of The Quad there have been rumors floating around of a possible second name change. I have a feeling parent company Caesars Entertainment intentionally used The Quad as a sacrificial placeholder until they were able to renovate the hotel rooms. Now with a $223 million renovation underway it only makes sense to remove the bad stigma (and reviews) of the old Quad/IP hotel rooms and go for a total re-brand. 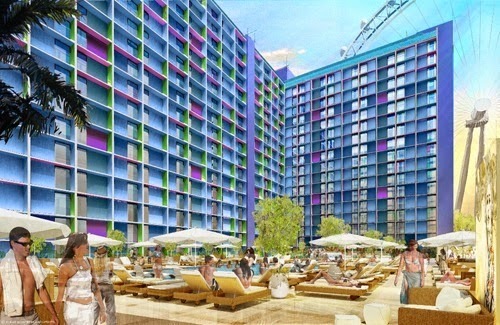 From the Caesars Entertainment renderings it looks like the outside of the hotel will be getting a fresh new look. It's not really clear if the balconies will remain functional, or if they will be closed off and just for decoration. The splash of green and purple looks good, and I bet it will be even better at night. The rooms look like a modern update that has become pretty standard among room renovations these days. 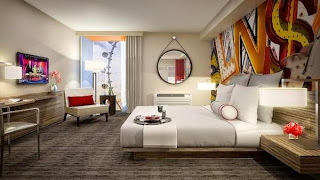 The mural behind the bed is a unique touch, and what looks to be laminate flooring takes a cue from the Flamingo Fab rooms. New rooms come with a new price. A quick search shows The Linq rooms going for 2-3 times the price of what The Quad rooms did. Considering the prime center Strip location that still might be a pretty good deal though. With a $223 million renovation budget it should be pretty nice.